One of the most recognized names in Hawai'i labor history now also belongs to an endowment to provide perpetual support for Labor Studies at the University of Hawai'i - West O'ahu. 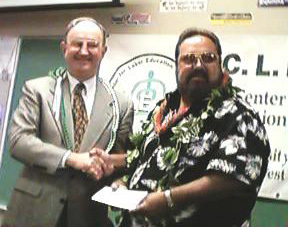 On July 12, 1999, Unity House President Anthony "Tony" Rutledge signed a memorandum of understanding establishing the Art Rutledge Endowment in Labor Studies at UH–West O'ahu’s Center for Labor Education and Research (CLEAR) in memory of his father, who founded Unity House. Joining him for the ceremonial signing at the leeward campus were former UH President Kenneth Mortimer, UH West O'ahu Chancellor William Pearman, former Interim UHWO Chancellor Joanne Clark and CLEAR Director William Puette. "It is fitting that this endowment be established as a tribute to the founder of Unity House," said Dr. Mortimer. "Mr. Rutledge was one of Hawai'i’s foremost labor leaders; his grasp of economic and labor policy issues and their application to collective bargaining is legendary." 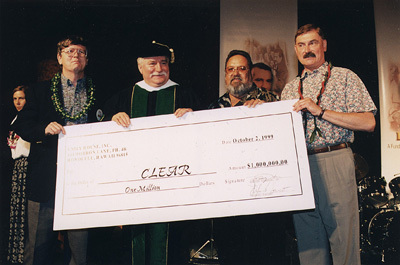 The first check of $250,000 for CLEAR at UH West O‘ahu was in October followed by another $750,000 bringing the full endowment to a full million dollars! " This gift reflects the Unity House commitment to the state of Hawai‘i," said Anthony Rutledge, presenting the inaugural donation that established the endowment. The second check was further enhanced by proceeds from a special fund raiser for CLEAR at which famed Nobel Peace Prize Winner and former Polish President Lech Walesa was a featured speaker to celebrate and expand the new endowment and memorialize Arthur A. Rutledge. Income from the endowment supports labor studies at UH West O'ahu, said UHWO Chancellor Pearman. The endowment will fund the Art Rutledge Lecturer in Labor Studies, who will serve as a faculty member for CLEAR at UH West O'ahu, and Faculty development activities and projects that support the development and enhancement of labor studies as well as research projects consistent with the purpose and mission of CLEAR.